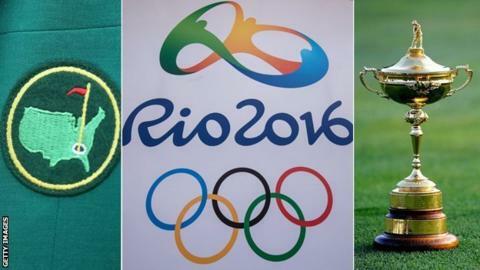 Rio, Ryder Cup, McIlroy's Grand Slam - what does 2016 hold? It is likely to be a golfing year like no other in living memory. The return of the sport to the Olympics means a crowded schedule and new narrative. Furthermore, 2016 is a Ryder Cup year with the United States probably boasting a side emblematic of a new generation less haunted by so many recent defeats. September's running of the biennial clash between Europe and America is one of the big highlights in what promises to be an enticing year. Here's my month-by-month guide to what might happen as we head to the Hazeltine showdown that starts on 30 September. The Eurasia Cup doesn't carry the cache of the Ryder Cup, but skipper Darren Clarke views the match between his Europeans and their Asian counterparts, led by India's Jeev Milkha Singh as a valuable exercise. The English quartet of Danny Willett, Andy Sullivan, Matthew Fitzpatrick and Chris Wood harbour hopes of Ryder Cup debuts in September. The same applies to Ireland's Shane Lowry and all five are in Clarke's team in Malaysia for the matchplay tournament which runs from 15-17 January. They have the opportunity to impress and form partnerships that may influence the skipper's wildcard strategies later in the year. Clarke's picks, Lee Westwood and Ian Poulter, are known quantities - their form as the year goes on will be more significant than what they do in this match. Then all eyes turn to Abu Dhabi (21-24 January) where world number one Jordan Spieth heads a field that includes Rory McIlroy and Rickie Fowler. It's the first truly big name gathering of the new year. Several leading Europeans, including McIlroy, Justin Rose and Luke Donald will take advantage of the PGA Tour's West Coast swing. The women's game meanwhile heads down under for the Australian Open (18-21 February) and the LPGA Tour then moves on to Thailand. Look out for Britain's Holly Clyburn, embarking on her rookie season after gaining playing privileges from LPGA Tour School. The top players will gather for the first of the year's four World Golf Championships near Miami from 3-6 March. But its location at Trump Doral is likely to dominate the headlines. US presidential candidate and tournament host Donald Trump will make sure that is the case. Chatter on a likely date for Tiger Woods' return will probably begin to intensify. If he has been making good progress recovering from back surgery he may target the Arnold Palmer Invitational at Bay Hill which starts on 17 March. Arnie's event is likely to come too soon, though, and current indications suggest Woods will not be ready for the Masters either (7-10 April). Provided they can fend off Augusta specialist Bubba Watson, the first major should be a showdown between the top three players in the world, Spieth, Jason Day and McIlroy. Defending champion Spieth has never finished outside the top two at Augusta while US PGA Championships titleholder Day is the game's most recent major winner and has finished second and third in previous Masters. McIlroy was fourth last year - his best Augusta return. Having added tournaments to his early season schedule, I suspect the Northern Irishman will be ready to clam his first Green Jacket and complete the career Grand Slam, having already won the Open, US Open and US PGA. The European Tour finally settles on the continent of its name in the latter part of the month. Expect another strong line up for the McIlroy promoted Irish Open at the K Club (19-22 May) but prepare for some potentially big name absences at Wentworth the following week. McIlroy, the champion at the BMW PGA Championship in 2014, may skip the event to help preparations for the US Open and the hectic schedule beyond. It will be the last competition before Wentworth's West Course is closed for another major overhaul. How the Tour markets the tournament will be interesting after chief executive Keith Pelley admitted its £3.7m prize fund is too low for it to be considered its "flagship event." After the remodelled and rough-free Pinehurst of 2014 and the links-like Chambers Bay last year, expect a more traditional US Open at Oakmont (16-19 June). This brute of a course will play as long as the rough will feel and boasts 210 bunkers including the famous Church Pews on the third. Key components will be length, accuracy and patience - just how they like it at the major regarded as the toughest test in golf. It should suit Jason Day perfectly. The scramble to make Olympic qualification is heading towards it's July climax and, somewhat farcically, the line ups will be known before the Open is played in July. Now the golf season goes bonkers. The month starts with the Women's US Open at CordeValle in California (7-10 July) and a significant clash of tournaments in the men's game. The European Tour has pulled out of the WGC Invitational in Akron in support of the French Open, which is played at the same time - 30 June - 3 July. They hope for a big name field because rules have been manipulated to make the Paris event, which is celebrating its centenary, count as two of the five events needed to retain membership, while there will be no Ryder Cup points on offer for those Europeans who play in the US. A fortnight later it's The Open at Royal Troon, hosted by the men's and women's clubs based there to head off any rows over golfing sexism. Rickie Fowler is my tip to break his major duck on the Ayrshire coast. By the end of this extraordinary month the US PGA will have been completed at Baltusrol (28-31 July) where Dustin Johnson may have emulated Fowler's feat of becoming a first time major champion. Simultaneously, England's Charley Hull will be trying to make local knowledge count at her home course of Woburn, which stages the Ricoh Women's British Open. Hull and Scotland's Catriona Matthew are expected to make up the British women's team at the Rio Olympic Games. They will struggle for on course preparation because they will have to wait for completion of the men's tournament (11-14 August) where Rose and Willett are the frontrunners to wear British colours. McIlroy plays for Ireland and currently seems lukewarm on the Olympic experience. Then again, he thought the Ryder Cup was an exhibition until he played in it. In the men's let's go for US gold for Spieth (he'll call it the fifth major) and the sound of the New Zealand anthem as Lydia Ko triumphs in the women's event (17-20 August). The nine automatic qualifiers for Clarke's Ryder Cup team will be known at the end of the month. Here's my guess: McIlroy, Rose, Henrik Stenson, Sergio Garcia, Victor Dubuisson, Sullivan, Fitzpatrick, Thomas Pieters and Lowry. The skipper will hope there is sufficient form shown to allow him to pick knowhow from the likes of Westwood, Poulter, Donald, Graeme McDowell, Jamie Donaldson, Ross Fisher and Stephen Gallacher. Relentlessly they motor through the PGA Tour's lucrative play-offs with US Ryder Cup skipper Davis Love closely monitoring performances. His eight qualifiers will be known at the end of August, with three of his four picks made on 11 September. The final one is made at the conclusion of the Tour Championship in Atlanta (22-25 September). Here is my best guess on the eight US qualifiers: Spieth, D Johnson, Fowler, Bubba Watson, Brooks Koepka, Justin Thomas, Patrick Reed and Matt Kuchar. The last day of the month sees hostilities open at Hazeltine with the Americans boasting an all-star line up of vice captains; the already selected Woods, Jim Furyk and Steve Stricker as well as, surely, Phil Mickelson. Will Team Europe be holding the Ryder Cup again in October? Europe begin the month celebrating yet another Ryder Cup victory. Clarke has used competitive intuition to inspire his rookies while America hold yet more inquests into their inability to win these matches. Well that's one scenario, but the opposite outcome is just as likely. The Ryder Cup promises to be as intriguing as ever and this is one prediction where I'd prefer to sit on the fence. But, if pushed, how about a 14-14 draw, with Europe retaining the trophy? It may prove an inspired bet.